Come discuss thought-provoking speculative fiction in a group that welcomes diversity. Science fiction and fantasy can be a great escape, but it can also be a great way to examine social issues and alternative viewpoints or identities. Historically, science fiction has often been used as a way of commenting on the biases of the age in which it is written, using metaphors such as the creation of robots, alternative relationships between alien species, and the colonization of other worlds to show contemporary problems or questions in a new light. The aim of this group is to enjoy reading provocative science fiction (and occasional fantasy) stories and discussing the themes they might present, in both the original context and for us as individuals today. This group meets the third Monday of every month at 7pm in the writing corner on the mezzanine level of Village Books. Authors DO NOT attend. A ground-breaking work both of feminist SF and of world-building hard SF, it concerns the Sharers of Shora, a nation of women on a distant moon in the far future who are pacifists, highly advanced in biological sciences, and who reproduce by parthenogenesis--there are no males--and tells of the conflicts that erupt when a neighboring civilization decides to develop their ocean world, and send in an army. 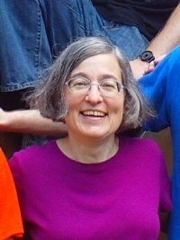 Joan Slonczewski is currently considered a "single author." If one or more works are by a distinct, homonymous authors, go ahead and split the author. Joan Slonczewski is composed of 3 names. You can examine and separate out names.